Former Clay County Circuit Judge Cletus R. Maricle has been permanently disbarred following his guilty plea of committing vote fraud. Court documents showed Maricle had used his position to bribe officials, candidates for county offices, defendants in his court, and family members of defendants in his court. Ex-Judge Convicted of Vote Fraud , Lexington Herald-Leader, September 18, 2014. A preliminary investigation into the New Georgia Project has revealed significant illegal activities including forged voter registration applications, forged signatures on releases and applications with false or inaccurate information. The New Georgia Project is an offshoot of the organization Third Sector Development, a group founded and led by Democrat GA House Minority Leader Stacey Abrams. State launches fraud investigation into voter registration group , Channel Two Action News, September 9, 2014. The Fairfax County Electoral Board referred 17 individuals to the DOJ for investigation of possible voter fraud. The individuals seem to have voted in both Fairfax County as well as throughout Maryland in the 2012 elections, and in the case of some individuals, multiple elections over the last decade. Fairfax County Electoral Board Refers Potential Voter Fraud Cases for Investigation , Fairfax County Press Release, August 25, 2014. Virginia Voters Alliance drew attention to multiple duplicate voter registrations in Maryland and Virginia. They said there are 14,646 duplicate registrations between Fairfax County, VA and Maryland alone. If a voter is convicted of voter fraud in Maryland, they are still allowed to vote, as it is only a misdemeanor; in Virginia, it can result in a year in prison and $2,500 fine. Investigations underway, suspected voter fraud in Virginia and Maryland , Daily Caller, August 21, 2014. More than 140 people are alleged to have listed their current address as a mail center in the basement of a Minneapolis, Minn. commercial property while registering to vote. An investigation has been started as to whether or not there is a coordinated effort to register voters using the 419 Cedar Avenue address in Minneapolis. 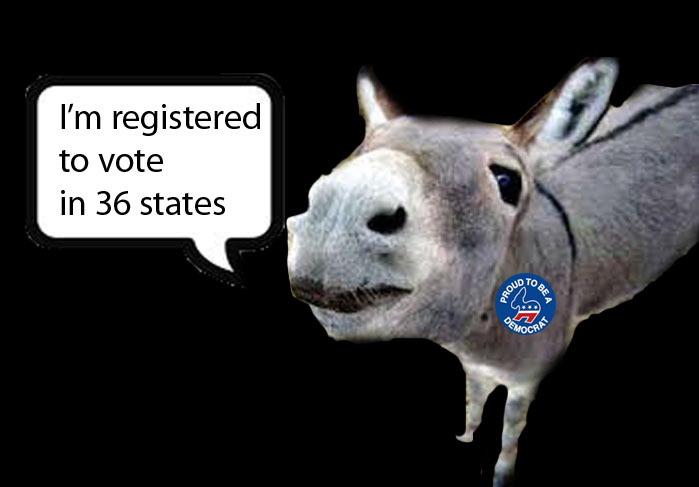 Some of these “voters” may also have been registered without knowing. Allegations of Voter Fraud in Hotly Contested Minn. House DFL Primary Race , Eyewitness 5 ABC News, June 27, 2014. An Alabama grand jury indicted the girlfriend of Dothan, AL commissioner Amos Newsome on 23 counts of vote fraud in the campaign to re-elect Newsome last August. The alleged vote fraud scheme includes two additional women – one charged with 20 counts of vote fraud, the other charged with 10. Dothan commissioner’s girlfriend indicted on voter fraud charges , Dothan First, June 20, 2014. A Texas judge invalidated a city commissioner election as a result of vote fraud. The judge carefully evaluated each of the 44 contested votes and found many of them were cast by people who deliberately and illegally voted under a “home is where the heart is” residency standard – they registered at homes belonging to the fraudulently-elected commissioner’s friends, neighbors, and relatives. Judge orders new election in Weslaco City commissioner race , KRGV, June 12, 2014. A Massachusetts man pled guilty to illegally voting in both the 2008 and 2012 NH primaries. He was charged with one felony county and two misdemeanor counts of “wrongful voting” under NH law for traveling from Massachusetts to New Hampshire to cast votes in both primaries. He was fined $5,000 and given a suspended prison term of one to three years. Carver man pleads guilty to voting illegally in NH , Taunton Daily Gazette, June 10, 2014. Former Bolivar, TN City Councilwoman Brenda Woods was sentenced for corralling felons to vote for her in the city’s 2009 municipal elections. Woods transported three felons to the polls to case votes for her. She used this method for her election to city council and her failed mayoral bid. She received a suspended sentence of two years in prison, and has lost her voting rights and her ability to run for elected office. Former Bolivar city council member sentenced , JRN News Channel 5, May 22, 2014. A Tennessee state elections commissioner is questioning whether to certify election results after six people voted twice in a Davidson County election last week. The fraudulent voters cast absentee ballots and also appeared at the polls on Election Day. The election worker has been fired. Nashville election worker fired over double voting , Tennessean, May 12, 2014. A California mayoral candidate is alleged to have recruited between 15 and 20 non-voters to cast absentee ballots illegally in April. The formal complaint submitted to the Los Angeles County District Attorney states that candidate Robert Garcia hired a bus to transport the individuals into the district to request absentee ballots. Complaint Against Robert Garcia Suggests Voter Fraud , Hews Media Group, April 21, 2014. A two-year investigation of voter fraud in Iowa uncovered 117 illegally cast votes resulting in six criminal convictions. The crimes included non-citizen voting and felony voting. Final Report: 117 Fraudulent Votes Found in Investigation , The Des Moines Register, May 8, 2014. Houston County Sheriff’s Office arrested three women on charges of voter fraud after the narrowly decided election. Police conducted a thorough investigation in which they discovered that the three women created and submitted false ballots in August 2013. Three Houston County Women Accused of Felony Voter Fraud , WTVY News, May 9, 2014. A poll worker in Hamilton County, OH is the eighth person to be indicted on charges of illegal voting in 2013. Authorities say that Ellen Elizabeth Duncan submitted an absentee ballot and also appeared at the polls on Election Day. Two More Indicted for Vote Fraud in Hamilton County , WVXU News, April 23, 2014. New Jersey authorities arrested mayoral candidate Rigo Rodriguez and his wife on charges that they submitted ballots as votes for people who did not vote in 2010. Prosecutors also stated that Rodriguez instructed campaign workers to lie to authorities investigating the allegations. Arraignment Postponed for Paterson Councilman, Wife in Election-Fraud Indictment , Examiner, February 17, 2014. Pennsylvania police have charged a man with ballot tampering in Pike County. Myron Cowher allegedly stole 70 ballots and planned to use different colored ink pens so the ballots did not all look the same. Wild Acres Man Charged with Voter Fraud in Board Election , The News Eagle, May 13, 2014. Under a plan being pushed by de Blasio and the council, noncitizens, including illegal immigrants, would be given city-issued identification cards. . . .GOP State Senator Greg Ball this would open the door to noncitizens, including illegal aliens, to vote illegally in New York State Elections. N.Y. GOP Sen. says Bill de Blasio plans for illegal voting in New York , Examiner, February 17, 2014. We confirmed with the city clerk’s office that a vote under Former Jeanne Shaheen spokesperson Caitlin Legack's name and address was recorded. But Legacki moved out of New Hampshire shortly after the 2008 election (in which she voted) and was in St. Louis on Election Day 2012, working for U.S. Sen. Claire McCaskill. ." Vote fraud: It, and mistakes, happen, Union Leader, January 27, 2014. Investigators posing as dead voters were allowed to cast ballots for this year’s primary and general elections, thanks to antiquated Board of Election registration records and lax oversight by poll workers, authorities said. Undercover DOI agents were able to access voting booths in 61 instances — including 39 dead people, 14 jail birds and eight non-residents. The dead can vote in NYC, New York Post, December 30, 2013. 12/27/13: North Carolina: Fraudlent Election Requires "Do Over"
Voters in the Robeson County town of Pembroke will go to the polls a second time to elect town council members after the State Board of Elections found many “irregularities” in the November election and ordered a new vote. In a written order released Friday, the state board found that problems “occurred to such an extent in this election that they tainted the results of all the Pembroke municipal elections and cast doubt upon their fairness.”Irregularities found in Pembroke election; town to vote anew in 2014, News & Observer, December 27, 2013. Ohio Secretary of State Jon Husted announced Wednesday that his office found 17 non-citizens illegally cast ballots in the 2012 presidential election -- and has referred the case for possible prosecution. The alleged crime would be a notable case of voter fraud in a key swing state. By law, only American citizens are allowed the privilege of casting ballots for the nation's leaders. Non-citizens caught voting in 2012 presidential election in key swing state, Fox News, December 18, 2013. Williams registered a woman who is a convicted felon and not eligible to vote. Buckley said Williams also allegedly falsely registered another person who was ineligible to vote.Former congressional candidate, Cobby Williams, arrested on voter fraud charge, Mississippi Business Journal, December 13, 2013. Police watch multiple people attempt to impersonate voters and do nothing. The NYPD later answers that "allegations of voting fraud weren't under the department's purview." Brazen Voting Fraud Alleged Among Ultra-Orthodox In Williamsburg, Gotham News, September 11, 2013. Democrat Election Commissioner Frances Knapp was indicted and plead not guilty to 46 felony counts and 48 misdemeanor counts of official misconduct and other charges. The most serious charges against Knapp, however, involve Knapp's involvement in absentee ballot fraud. Knapp allegedly tampered with the computer system sending of absentee ballots. Many of these victimized voters were residents of Maplewood Apartments, a senior living complex in Poughkeepsie managed by Knapp. Eric Shawn, More on NY Vote Fraud Scandal, Apartment Manager Vote Fraud?, RNLA Blog, August 1, 2013 (Post includes multiple links to local sources). “The most amazing part about this voter fraud case involving the highest office in the United States is the fact that such a few number of people, because of laziness, arrogance or both did not do their job and thus could have affected the outcome of the election," noted St. Joseph County Republican Party Chairwoman Dr. Deborah Fleming.“ Eric Shawn, Dem Official sentenced to prison for ’08 ballot fraud in Obama-Clinton primary, Fox News, Jun 17, 2013. “FEMA official charged in voter fraud case. Federal Emergency Management Agency official has been arrested in connection with a voter fraud case in St. Johns County, Florida. Michel Pawlowski, 68, was named in a complaint last fall alleging voter fraud. He lives in Maryland. His daughter ran for St. Augustine Beach city commission and won.” FEMA Official Charged in Voter Fraud Case, News 4 Jax, June 14, 2013. “The Daily Republic reports that Craig Guymon was arrested on charges of voter fraud. Police say Guymon voted Tuesday morning at the Mitchell Career and Technical Education Academy and later returned an absentee ballot to the Davison Auditor's Office.” Associated Press, South Dakota man arrested and charged with voter fraud, Rapid City Journal, Jun 5, 2013. “Top staffer for Florida Democratic Rep. Garcia resigns amid voting fraud probe. The congressman said he thinks the plot was a “well-intentioned attempt to maximize voter turnout” and that the system is “prone to fraud.” AP, Top staffer for Florida Democratic Rep. Garcia resigns amid voting fraud probe, Fox News, May 31, 2013. “The most amazing part about this voter fraud case involving the highest office in the United States is the fact that such a few number of people, because of laziness, arrogance or both did not do their job and thus could have affected the outcome of the election," noted St. Joseph County Republican Party Chairwoman Dr. Deborah Fleming.“ Eric Shawn, Report: Mount Vernon Group Says Voting Fraud Has Riddled School Elections, Mount Vernon Daily Voice, May 6, 2013. “Milwaukee County prosecutors Thursday filed voter fraud charges against 10 people, including two accused of double voting in 2012 elections and two felons ineligible to vote. Also among the fraud cases: a Milwaukee woman who is accused of signing a recall petition against Republican Gov. Scott Walker three times; and the petition circulator who collected those signatures.” Steve Schultze and Bruce Vielmetti, Milwaukee Prosecutors Charge 10 With Voter Fraud, Milwaukee-Wisconsin Journal Sentinel, Mar. 21, 2013. "Richardson told a local television station this month that she voted twice last November. She cast an absentee ballot and then voted at the polls as well...Authorities also are investigating if she voted in the names of four other people, too, for a total of six votes in the 2012 presidential election." Eric Shawn, Did Obama supporter vote 6 times in 2012? Ohio poll worker target of investigation, Fox News, Feb. 19, 2013. "Aurora Ivarra says she was intimidated when a town employee wearing a badge came to her door on Sunday and tried to convince her that voting absentee or by mail is illegal... The town of Cicero claims it was sending people door-to-door to investigate alleged absentee voter fraud. The town was concerned about a record number of requests for mail in ballots." Cicero candidates accuse each other of voter fraud, ABC Local, Feb. 18, 2013. "A North Vernon man who worked on a former Jeffersonville mayor’s re-election campaign in 2011 has agreed to plea guilty to three counts of vote fraud in Jennings County Circuit Court on charges related to a campaign there." Matt Koesters, Ex-campaign worker accepts plea in voter-fraud case, News and Tribune, Feb. 14, 2013. "A Northeast Side woman was fined $500 today for voting twice in the 2010 general election. Dominique Atkins, 38, of Barnes Drive E., pleaded guilty to a misdemeanor count of attempted illegal voting." John Futty, Woman fined for voting twice in 2010 election, Columbus Dispatch, Jan. 31, 2013. "Milwaukee prosecutors are investigating at least two instances of suspected voter fraud from the presidential election in November, court records reveal. In one matter, investigators seek records that might prove Leonard K. Brown voted twice in the November election, once in Milwaukee and again in West Milwaukee. The other suggests a Mukwonago man voted there and in West Allis. That man, Chad Vander Hyden, was arrested on charges of double voting in December after he declined West Allis detectives' invitation to come in and discuss what appeared to be his signature on poll records." Bruce Vielmetti, Milwaukee prosecutors investigating voter fraud, Journal Sentinel, Jan. 23, 2013. "A North Vernon man and longtime Jennings County Democratic Party worker will plead guilty to three counts of vote fraud, according to terms of a plea agreement filed Friday in Jennings County Circuit Court. Michael R. Marshall, 60, will plead guilty to the three offenses, all Class D felony charges that his attorneys will argue to be reduced to Class A misdemeanor charges before Judge Jon Webster." Bryce Mayer, Plea agreement reached in voter fraud case, Plain Dealer-Sun, Jan. 21, 2013. "Karl Reinelt, A 51-year-old felon, was charged in Waukesha County Circuit Court with one count of election fraud after voting in the Nov. 6, 2012 election." Steve Garrison, Pewaukee felon charged with voter fraud, Living Lake County, Jan. 18, 2013. "Former East Longmeadow Selectman Enrico “Jack” Villamaino has been released on his own recognizance after he and his wife Courtney Llewellyn answered to new charges in their voter fraud case...The two are accused in a voter fraud scheme, where in which 280 East Longmeadow residents had their party registration changed from Democratic to unenrolled. 280 applications for absentee ballots were then dropped off at the East Longmeadow Town Clerk’s office." Laura Hutchinson, New Charges for Villamaino and Llewellyn in Voter Fraud Case, WWLP, Jan. 10, 2013. "The Scotland County Board of Elections is expected to initiate fraud charges against a felon that officials say voted during in last year’s general election." Mary Katherine Murphy, Board to pursue voter fraud case, Laurinburg Exchange, Jan. 9, 2013. "According to a Dec. 20 statement from the US attorney’s office , Smith allegedly submitted fraudulent requests for absentee ballots, then cast those ballots on behalf of voters without their knowledge. Prosecutors say Smith also knowingly delivered absentee ballots to ineligible voters, knowing that their votes in his favor would be fraudulent. Smith was charged with two misdemeanor counts of deprivation of rights under color of law. He faces up to two years in prison, and prosecutors will recommend a 6-month sentence, according to his plea agreement, which also requires that he vacate his seat in the Legislature and prohibits him from seeking another elected office for the next five years." Martine Powers, Everett legislator, charged with voter fraud, vacates seat, Boston Globe, Jan. 2, 2013. "District 4 Election Commissioner Carl Payne reported an incident in which "a father cast an absentee ballot, the son voted in person and then the son changes clothes and returned to vote as his father. We learned of this from a written statement from the poll manager." Among other cases reported by Payne (who was defeated Nov. 6 by Sissie Ferguson): A voter came to cast a ballot, gave a name that was on the poll book, signed the receipt book and was allowed to vote. Another person using the same name came to vote later that day, "and was informed he'd already voted. The second person provided proof of identity," Payne reported. Also, a voter cast a ballot in person at the proper precinct — and then prepared a provisional ballot, including a sworn affidavit, at another precinct." Henry Bailey, Potential voter fraud in DeSoto turned over to investigators, The Commercial Appeal, Dec. 20, 2012. "A 61-year0old Belleville man was sentenced Thursday to five years in prison for submitting phony absentee ballots while he was working on the 2007 election campaign of state Sen. Teresa Ruiz (D-29)." Belleville man gets five years for voter fraud, Belleville Patch, Dec. 20, 2012. "Auglaize County officials are looking into possible voter fraud after discovering one resident may have voted twice in the Nov. 6 election." Amy Kronenberger, POssible voter fraud incident in Auglaize County, The Daily Standard, Dec. 14, 2012. "Court documents indicate that Hays was registered to vote in both Mohave County and Coconino County. He used a campaign worker’s address in Kingman along with that of a shooting range, also in Kingman, when he filled out paperwork to run for sheriff. But prosecutors say he was actually living in Flagstaff and working for the Arizona Department of Corrections in Winslow." Hays pleads guilty to voter fraud, Mohave Valley Daily News, Dec. 10, 2012. "A Cottage Grove man told police Nov. 6 that someone had committed voter fraud by signing his name at a polling place, making it impossible for him to vote. The incident was being investigated. "Cottage Grove police reports for Nov. 29: Drugs, suspicious activity, voter fraud, burglary, South Washington County Bulletin, Nov. 29, 2012. "Three cases of possible voter fraud are under investigation in Allen County. Ken Terry, director of the Allen County Board of Elections, announced the cases were passed on to the prosecutor's office after three people voted twice in the Nov. 6 election. He told the board during a special meeting at the Allen County Board of Elections on Monday." Sarah Stemen, Three possible cases of election fraud sent to Allen County prosecutor, Nov. 26, 2012. "The Mower County Auditor-Treasurer’s office, after its review of local election ballots, discovered three people who may have illegally voted this year. According to Auditor-Treasurer Doug Groh, all three people indicated that they are not citizens on their voter registration forms. However, the three people continued to fill out their forms and also voted." Matt Peterson, Groh: 3 local ballots showed illegal voting, Austin Daily Herald, Nov. 26, 2012. "The Lorain County Board of Elections is investigating a Henrietta Township man who cast two ballots during the presidential election. The man, who could potentially face criminal charges for voter fraud, requested an absentee ballot on Oct. 23, and the ballot was returned to the elections board Nov. 3, according to board records. The man then voted at his polling place Nov. 6." Brad Dicken, Henrietta Township man accused of voting twice, The Chronicle Telegram, Nov. 21, 2012. "there were at least two instances of “outright voter fraud” — one in the city of Poughkeepise and another in Pleasant Valley — where a voter went to vote only to find someone had forged that person’s name and voted in their stead." Patricia Doxsey, Dutchess County voting marred by controversy, Daily Freeman, Nov. 8, 2012. "An individual by the name of Andrew Gail Holmes voted early in Sampson County, North Carolina and then appeared at their precinct today to vote again, according to the staff director of the Sampson County Board of Elections, Donna Mashburn. “We have a gentleman who had early voted,” Mashburn told me this morning, “and went to his precinct to vote. We are aware of it. We will handle the issue at canvassing.”" Bryan Preston, Democrat Double Voter Caught in North Carolina, PJ Tatler, Nov. 6, 2012. "According to state records, Carol has voted in the last two presidential elections, despite having passed away...NBC Bay Area found several other examples, too. People like Sara Schiffman of San Leandro who died in 2007 yet still voted in 2008, or former Hayward police officer Frank Canela Tapia who has voted 8 times since 2005, though he died in 2001." Stephen Stock, Felipe Escamilla and Kevin Nious, Dead and Still Voting, NBC Bay Area, Nov. 6, 2012. "The father of a mentally handicapped woman claims his daughter and others were “carted off” to a North Carolina polling site last week and “coaxed” into voting for President Obama by workers of the group home where she stays Judson Berger, Group home accused of taking patients to vote for Obama, Fox News, Nov. 5, 2012. "The Community Voters Project is a "non-partisan" lefty organization whose mission is to register people to vote, with a particular emphasis on minorities. In the 2008 election, they had offices in 10 states and registered around 300,000 minority voters. So far, so good. This year, however, it seems they aren't registering everyone who wants to vote. Outside a CVP office in Philadelphia, for example, they shredded and threw away numerous registration forms. A number of these were for people trying to register as a Republican." Mike Flynn, Philly activist group shreds GOP registrations, Breitbart, Nov. 5, 2012. "The daughter of an Alzheimer’s patient is fighting mad that a Henrico County rehabilitation facility cast her mother’s vote in the face of warnings that the elderly woman “doesn’t know what she is doing.” Janet Benedict, of Louisa, told Watchdog.org she was stunned when the activities director at Lexington Court informed her that 81-year-old Dorene Hagen had voted via absentee ballot." Kenric Ward, VA: Power of attorney doesn't stop Alzheimer's patient from voting, Watchdog, Nov. 5, 2012. "FOX Undercover found out something else about Santiago-Vazquez. He's been registered to vote from his home address in Lawrence since 2010. Our investigation shows he's not the only registered voter in Lawrence who is not a citizen. By cross-checking Lawrence voter records with criminal records that included records indicating lack of citizenship, we found three others: * Bruno Paulino is a legal resident detained by immigration authorities earlier this year, has been a registered Lawrence voter since 2009; * Jose Jimenez, a legal resident who faces "potential deportation to the Dominican Republic", according to federal court records, has been a registered Republican in Lawrence since 2010; * and Marcos Acosta, picked up during a recent immigration sweep, has been a registered voter in Lawrence since 2008." Non-citizens registered to vote in Lawrence but officials shrug, Fox Boston, Nov. 5, 2012. "The listing, "Adolf Hitler, John...666 Heltz...la," puts his supposed residence in Los Angeles. It was part of a batch of roughly 200 voter registrations that election officials say were flagged as possibly fraudulent, forged, or duplicated by the group that collected them, FieldWorks, a private Washington, D.C. based firm. FieldWorks, says it works largely with Democratic candidates, causes and progressive organizations collecting signatures for voter registration or ballot initiatives across the country." Eric Shawn, Hitler Appears on Ohio Voter Registration Form, Fox News, Nov. 4, 2012. "The Texas Secretary of State has asked the state Attorney General to look into a complaint of "vote-harvesting" centered around a San Antonio cemetery." Complaint alleges widespread voter fraud in South Texas, Gonzales Cannon, Nov. 2, 2012. "A criminal complaint accuses Roxanne Rubin of casting a ballot at an early voting location in Henderson on Oct. 29, then trying to vote again at a polling site in Las Vegas on the same day. "Woman arrested in Nevada for alleged voter fraud, San Francisco Chronicle, Nov. 2, 2012. "A temporary worker with the Clackamas County Elections Division is under investigation over a possible criminal violation of Oregon Election Laws. Oregon Department of Justice spokesperson Jeff Manning confirmed Friday that the state is investigating whether the employee tampered with ballots." Chad Carter, Clackamas Co. elections employee investigated for ballot fraud, KOIN 6, Nov. 2, 2012. "The South Dakota GOP accused Democrats on Thursday of trying to buy votes by serving food at a series of get-out-the-vote rallies" SD Republicans accuse Dems of trading chili for votes, Associated Press, Nov. 2, 2012. COLORADO: "How would you feel if you went to vote for Mitt Romney, but it turned out you voted for Barack Obama? That's the concern in Pueblo County as early voters are coming forward, saying electronic voting machines changed their vote. Reports of problems have come from every polling location in Pueblo county." Voting machines changed their vote, some say, KOAA, Nov. 2, 2012. OHIO:"Joan Stevens was one of several early voters at the polls on Monday. But when Stevens tried to cast her ballot for president, she noticed a problem. Upon selecting “Mitt Romney” on the electronic touch screen, Barack Obama’s name lit up. It took Stevens three tries before her selection was accurately recorded." Nick Bechtel, Problem found at board of elections, Marion Star, Oct. 31, 2012. KANSAS: "Nancy explained that while her husband was casting a vote for Romney, the touchscreen highlighted Obama." Liz Klimas, MORE ELECTRONIC VOTING MACHINES CHANGING ROMNEY VOTES TO OBAMA: WE LOOKED INTO IT AND HERE’S WHAT A VENDOR TOLD US, The Blaze, Oct. 31, 2012. NEVADA: "a voter in Las Vegas tried voting for Governor Mitt Romney but the machine automatically checked “Obama” multiple times instead." Voter Machine in Las Vegas Checking Obama, Politichicks, Oct. 25, 2012. NORTH CAROLINA: "On Monday, several voters complained that their electronic ballot machine cast the wrong vote....One of the voters, Sher Coromalis, says she cast her ballot for Governor Mitt Romney, but every time she entered her vote the machine defaulted to President Obama." Scott Gustin, Brandon Jones and Charlie Glancy, Guilford Co. voters say ballot cast for Romney came up Obama on machine, Fox News, Oct. 23, 2012. "Faurest Stum says she voted at the Pleasant Garden Town Hall location. Her vote was for Mitt Romney, but the machine cast the vote for Barack Obama." Scott Gustin, Brandon Jones and Charlie Glancy, More voting problems reported in Jamestown, Pleasant Garden, Fox News, Oct. 24, 2012. "Former Town Councilwoman Linda Lyons faces voter fraud-related charges after allegedly trying to vote twice during last year’s election, according to a Wake County prosecutor." Former Morrisville councilwoman faces voter fraud charge, News Observer, Oct. 30, 2012. "The Pima County Recorders Office is investigating a case of voter fraud. F. Ann Rodriguez said, while verifying signatures, her operators came across a signature that did not match that of two voters, a husband and wife. Her office then contacted the couple, who confirmed they had not even received their ballots in the mail" Voter fraud investigation underway in Pima County, KVOA News, Oct. 30, 2012. "Muscatine resident Craig White says a Democratic campaign worker somehow gave his 75-year-old mother the impression that it was OK for her to sign his name on an absentee ballot request form when he wasn’t home." Absentee ballot issues reported in 2 Iowa counties, Des Moines Register, Oct. 29, 2012. "Sheriff's deputies booked Douglas "Barthlomew" Claiborne, 30, in Mansfield, into the DeSoto Parish Detention Center on a warrant issued by the 10th Judicial District in Natchitoches Parish. The Times reports the arrest warrant was based on a complaint by the Louisiana Secretary of State's Election and Compliance Unit. It accuses Claiborne of "procuring falsified voter registration applications. "DeSoto School Board member booked with voter fraud, Associated Press, Oct. 23, 2012. "[former Democrat state Rep. Hudson]Hallum and three others have pleaded guilty to federal charges of conspiracy to commit election fraud during the special election that put him in the Arkansas House of Representatives in 2011. A total of nine people have been charged by federal and state authorities in connection with the plan." Eric Shawn, Vodka for votes: Arkansas rep, operatives await sentencing in fraud scheme, Fox News, Oct. 22, 2012. "Democratic volunteers offered people free t-shirts and pizza for voting early and posted official Obama campaign signs within 100 feet of the polling location, which is against federal and state election laws." Eli Stokols, Colorado GOP accuses Obama volunteers of electioneering at CSU, Fox KDVR, Oct. 22, 2012. "More than 800 absentee ballots have not made it to voters in Auburn Hills and are missing..." Auburn Hills missing hundreds of absentee ballots, Associated Press, Oct. 22, 2012. "The Florida Division of elections and state law enforcement officials are investigating "multiple" bogus letters sent to Florida voters to inform them that they have been flagged as suspected illegal, non-citizen voters...The letters appear to be going mostly or entirely to Republicans in Florida." Voter suppression efforts in Fla - against Republicans, Tampa Bay Times, Oct. 22, 2012. "Eugenia Huguenin says breast cancer killed her daughter long before a voter registration card with Michele Huguenin's name and supposed signature was filed this year in Palm Beach County." Andy Reid and Barbara Hijek, Dead woman among names on disputed voter forms, Sun Sentinel, Oct. 19, 2012. "Colin Small, was caught throwing out voter registration forms, Richmond, Va., the Rockingham County sheriff's office confirmed to CBS News." Lucy Madison, Man charged after tossing voter registration forms in Virginia, CBS News, Oct. 19, 2012. "In documents filed with the Secretary of State, [former St. Augustine Beach Mayor Frank] Charles claims that the father of City Commissioner Undine Pawlowski, 68-year-old Michel S Pawlowski, has fraudulently misrepresented his place of residence at the beach, presumably so that her gentleman friend, Edward Stephen George, can pick up another critical vote." Former mayor claims voter fraud at beach, Historic City News, Oct. 19, 2012. A judge set a $10,000 cash bail for Enrico "Jack" Villamaino, after after the former East Longmeadow selectman pleaded innocent to a 12-count election fraud indictment. Jack Flynn, Former East Longmeadow Selectman Enrico "Jack" Villamaino denies 12-count election fraud indictment, The Massachusetts Republican, Oct. 17, 2012. "Three Franklin County residents face felony charges of voter fraud after the Board of Elections reported that they had voted more than once in a past election." 3 People Indicted for Felony Vote Fraud, The Columbus Dispatch, Oct. 17, 2012. "In his lawsuit, Julien alleges that Josna and a woman named Carline Paul gathered several fraudulent absentee ballots from nursing homes and apartments. Josna has not responded to a court-ordered subpoena and a private investigator hired by Julien has not been able to track her down. On Tuesday, Judge Charles Francis reviewed more than 150 absentee ballots from two contested precincts in the race and found six of them to be invalid." Toluse Olorunnipa, Judge wants police to find 'Queen of Absentee Ballots', The Miami Herald, Oct. 16, 2012. "A former Oshkosh woman has been convicted of two felonies for election fraud and falsification of nomination papers. Yadira Colon was convicted Monday in Milwaukee County Circuit Court and sentenced to 20 days in jail and one year on probation." Former Oskhosh Woman Yadira Colon Convicted of Election Fraud, Associated Press, Oct. 15, 2012. "Oakland County prosecutors are expected to issue a misdemeanor election fraud warrant today against John Scott, an independent candidate for Oakland County commissioner." Election fraud warrant to be issued against candidate in Oakland County race, Detroit Free Press, Oct. 10, 2012. "The Florida Department of State on Friday confirmed that it has forwarded complaints about voter registration fraud that have been filed against the Democrats, as well as two other groups — the Florida New Majority Education Fund and the National Council of La Raza/Democracia USA." Gary Fineout, Voter fraud complaint filed against Fla. Democrats, San Francisco Chronicle, Oct. 5, 2012. "Ten football players at North Dakota State pleaded guilty Tuesday to misdemeanor election fraud and were sentenced to community service for faking signatures on ballot measure petitions they were hired to collect. Among the players on the nation’s top-ranked Football Championship Subdivision team who pleaded guilty were starters Samuel Ojuri, Joshua Colville, Marcus Williams and Brendin Pierre. The other players were Lucas Albers, Aireal Boyd, Demitrius Gray, Bryan Shepherd, Antonio Rogers and Charles Smith III." 10 North Dakota State University football players plead guilty in petition fraud case, Washington Post, Oct. 2, 2012. "According to their research, voter registration numbers for Montgomery County resident Rufus Harris of Silver Spring, who died in 2002, was used to cast an absentee ballot in the 2008 general election. Prince George’s County resident George T. Zell of Hyattsville, who died in July 2004, cast a vote in the 2004 general election. Records also indicated that Harris became registered as a voter on Sept. 4, 2008, six years after his death. The group also identified two deceased people who were registered to vote after their deaths. James Proctor of Laurel died in 1988 and became registered in 1992, and Virginia Ann Given of Upper Marlboro, who died in 1991, also became registered in 1992. Both names remain on the Maryland rolls today as “inactive” voters, although neither have cast a vote under their new voter registration numbers." Mary Dowling, 67, who currently resides in a nursing home in Timonium, has two voter registration numbers. The latest voting records that are available show Dowling has been voting twice in almost every even-year election since 2002, in both the general and the primary. Ten out of 16 times Dowling voted by absentee ballot. Glynis Kazanjian, Dead people voted and registered to vote, Maryland Reporter, Sept. 30, 2012. "The firm, Strategic Allied Consulting, has been fired by the Republican National Committee after over 100 hundred allegedly fraudulent signatures appeared in Palm Beach County." Eric Shawn, RNC Fires Consulting Firm After Florida Counties Report Voter Registration Fraud, Fox News, Sept. 29, 2012. "John Fernandez, 61, of Belleville, was found guilty of election fraud following a two-week trial. The jury found Fernandez guilty of charges of conspiracy (2nd degree), election fraud (2nd degree), absentee ballot fraud (3rd degree), tampering with public records or information (3rd degree), and forgery (4th degree)." Darryl R. Isherwood, Essex man convicted of absentee ballot fraud, Politicker NJ, Sept. 28, 2012. "Five more Crittenden County residents were arrested and charged Tuesday with using absentee ballots to defraud an election official during three special elections in 2011.....The new charges were filed against Eric Fontain Cox of Earle and four people from West Memphis — Amos Sanders, Lisa Burns, Deshay Lorenzo Parker III and Leroy Grant." 5 charged iwth ballot fraud in Crittenden County, 4 guilty pleas already entered, Baxter Bulletin, Sept. 26, 2012. "Secretary of State Ken Bennett announced Tuesday that nine new cases of suspected voter fraud from the 2008 election are under investigation by the Arizona Attorney General. Bennett said the Cross-State Match program helps states exchange voter-registration history to keep people from voting more than once in any given election." Jim Cross, Arizona ready to crack down on voter fraud, KTAR, Sept. 25, 2012. "According to the indictment, Paul Etheridge, a candidate in the New Albany Democratic mayoral primary, knowingly forged or falsely made the official endorsement of the ballots of two women in March 2011. The indictment also alleges Etheridge solicited one of the women to complete the ballot, knowing she was ineligible to register to vote or to vote. The indictment also claimed Etheridge delivered the ballots to the women to vote. Separately, Joshua Clemons was indicted on charges he solicited two others to complete an absentee ballot knowing they were ineligible to register to vote or to vote and delivering the ballots to them to vote." New Albany mayoral primary candidate indicted on voter fraud charges, WLKY, Sept. 14, 2012. "Hawaii County detectives have opened an investigation into allegations of voter fraud during the 2010 election. Police declined to give details, but the Hawaii County Clerk's Office said in July that an audit of the county’s voter rolls showed four people voted twice in 2010 elections and that between 50 and 60 people were registered more than once." Hawaii County police open 2010 voter fraud investigation, Honolulu Star Advertiser, Sept. 11, 2012. "A Mexican who was deported decades ago for drug trafficking pleaded guilty this week to living illegally in Escondido under a false identity and fraudulently voting in the 2008 U.S. presidential election, federal authorities said Friday. Ricardo Lopez-Munguia, 45, pleaded guilty Thursday to attempted entry to the U.S. after deportation, making a false claim to U.S. citizenship, and voter fraud by an illegal alien, according to a statement from the U.S. attorney's office." Mexican man admits to voter fraud, Escondido, Sept. 7, 2012. "A DCI investigation has resulted in two individuals being charged with Election Fraud, a Class D Felony, and Fraudulent Practices, an Aggravated Misdemeanor. Those charged are 37 year old Jason Anthony Rawlin of Indianola, Iowa, and 37 year old Stacy Rae Brown of Kanawha, Iowa." More Election Charges Filed, Iowa Republican, 2012. "Fifteen people were charged Friday with violating North Dakota election law, many of them telling investigators they forged names on petitions they circulated in order to meet quotas and achieve bonus pay...According to the Cass County State’s Attorney’s Office, the individuals charged are: Lucas Albers, Aireal Boyd, Don Carter, Joshua Colville, Joshua Gatlin, Demitrius Gray, Darren (D.J.) McNorton, Sam Ojuri, Brendin Pierre, Antonio Rodgers, Bryan Shepherd, Charles (C.J.) Smith, Marcus Williams, Jennifer Krahn and William Brown." Dave Olson, 15 accused of rampant petition fraud in face of quotas, bonus pay; 10 Bison FB players charged, Inforum, Sept. 7, 2012. "Prosecutors said Democratic Rep. Hudson Hallum of Marion, Kent Hallum, Phillip Wayne Carter and Sam Malone acknowledged that they participated in a conspiracy to bribe voters to influence absentee votes in the Arkansas District 54 primary, runoff and general elections in 2011." Ark. lawmaker pleads guilty to election charge, Fox News 16, Sept. 5, 2012. "The Forum of Fargo-Moorhead reported the statement said formal misdemeanor charges against the others were expected in a day or so. The newspaper reported Tuesday eight North Dakota State University football players and one former player were among the 10 people suspected of fraud in attempts to place two measures on this fall's general election ballot." 10 to face voter fraud charges in N.D., UPI, Sept. 5, 2012. "Almost two years after his grand jury indictment on eight felony counts of voter fraud and perjury, state Sen. Roderick Wright has yet to stand trial. The longtime Inglewood Democrat may not get his full day in court before voters decide this fall whether to give him another term in the Legislature." Jean Merl, State senator's trial may begin just before election, Los Angeles Times, Sept. 2, 2012. "Two weeks ago, the Supervisor of Elections, Ann McFall, announced her office was looking into questionable absentee ballots gathered by Henry's campaign. In 2012, Henry won a city commission seat for zone five and was in office when he was charged and arrested for voter fraud after one of his workers fraudulently requested absentee ballots." Saul Saenz, Derrick Henry campaign responds to voter fraud allegations, News 13, Sept. 2, 2012. "Rep. John Patrick Julien’s official challenge to the results of the District 107 primary race for the Florida House includes allegations of absentee ballot fraud at assisted living facilities and nursing homes." Julien's claim of absentee ballot fraud focuses on nursing homes, ALFs", Miami Herald, Sept. 1, 2012. "Democratic congressional candidate Anthony Gemma on Wednesday accused U.S. Rep. David Cicilline of committing voter fraud." Michelle R. Smith, Gemma Accuses Cicilline of Voter Fraud, Boston Globe, Aug. 22, 2012. 8/15/12: Timothy Noel Zureick: voter registration fraud "A former Ohio University student was in jail in Hamilton County Wednesday, facing multiple felony counts for allegedly forging 22 signatures on a petition for the redistricting amendment to the Ohio Constitution. He faces an additional criminal charge for having allegedly signed his own name with a false address." Jim Phillips, Former OU student charged with forging signatures on redistricting petition, Athens News, Aug. 15, 2012. "A Plantation man who authorities said admitted voting in two presidential elections in Broward County though he is not a U.S. citizen has been indicted on federal charges. Federal investigators began looking at Josef Sever, 52, earlier this year when state officials forwarded his name as a possible illegal voter, according to court records. The indictment against Sever was made public on Monday." Paula McMahon, Just in time for primaries, Broward non-citizen indicted for voting, Sun Sentinel, Aug. 13, 2012. "An Iowa Division of Criminal Investigation agent has been assigned to work full-time with Secretary of State Matt Schultz's office to look into allegations of voter fraud" Agent reassigned to chase voter fraud, Associated Press, Aug. 11, 2012. "Sergio Robaina was charged with two felony counts of voter fraud for allegedly filling out the two ballots in a way that did not match the voters’ intentions. He also faces two counts of violating a county ordinance by possessing more than two absentee ballots belonging to others." Former Hialeah mayor's uncle arrested in absentee-ballot fraud investigation, Miami Herald, Aug. 10, 2012. "[F]our former staffers 'were engaged in a blatant attempt to commit forgery and election fraud,' Michigan Attorney General Bill Schuette said at a news conference in Detroit. 'They copied petitions, submitted petitions falsely signed by circulators and did cut-and-paste jobs that would make an elementary art teacher cringe,' Schuette said." David Bailey, Ex-US lawmaker's aides charged with faking vote petitions, Chicago Tribune, Aug. 9, 2012. "The Massachusetts Secretary of State’s Office is looking into possible voter registration fraud in east Longmeadow. The problem came to light when some voters in town say their party affiliations were changed without permission." Secretary of State Galvin Investigates Possible Voter Registration Fraud in East Longmeadow, WGGB ABC40, Aug. 7, 2012. "The Montgomery County Board of Elections is investigating a large case of possible voter registration fraud, after receiving more than 100 “suspicious” registration cards from a single organization, many that appeared to have false or nonexistent addresses." Jeremy Kelly, Montgomery Co. probes possible voter fraud, Dayton Daily News, Aug. 6, 2012. "A Record investigation found McNerney registered and voted in the primary election in Stockton, though his main residence appears to be in Pleasanton." GOP officials file complaint of voter fraud against McNerney, The Record, August 3, 2012. 8/2/12: TEXAS: nonresident voting "Upshur County GOP Chairman Ken Ambrose has filed a new complaint with the Texas attorney general regarding potential voter fraud in the county’s primary election....Ambrose said at least six people participated in early voting for the May 29 Republican Primary with “questionable” addresses." Christina Lane, Upshur County GOP chairman alleges voter fraud, News Journal, August 2, 2012. "Deisy Penton de Cabrera, 56, was charged with absentee-ballot fraud, a third-degree felony, and two misdemeanor counts of violating a county ordinance that makes it illegal for anyone to possess more than two ballots belonging to other voters. Investigators say Cabrera illegally collected at least 31 absentee ballots for the Aug. 14 primary election." Patricia Mazzei, Daniel Chang, Charles Rabin and Christina Veiga, Florida woman is charged with absentee-ballot fraud, McClatchy Newspapers, August 2, 2012. 8/2/12: TEXAS: vote fraud "Political activist Armando Gonzales says in his letter to Kennedy that there was suspect activity both during the early vote and on election day. He claims voters were unduly influenced on their way to the polls and at the voting booth." Complaint Filed Claiming Voter Fraud, Fox, August 2, 2012. "Esiquiel Silva joined the Citizens Against Voter Abuse because he said his father was almost victimized. He claims the elderly man was almost forced into a van headed to the polls to vote for a certain candidate. Silva said it all happened while his father was at an adult day care in Brownsville." Daisy Martinez, Keeping a Close Eye on Voter Fraud, Valley Central, July 30, 2012. "Authorities are investigating a case of potential voter fraud, right before the August primary. A 71-year-old Hialeah woman said she trusted a woman to fill out her absentee ballot. However, the woman took off with the ballot, and the elderly woman said she has no clue for whom she voted. "Alleged voter fraud incident under investigation, WSVN, July 30, 2012. "According to the amended petition, more than 30 people cast a ballot who were not registered to vote at least 30 days before the election. The petition states the voters registered between May 14-19. The primary was May 29. It also lists several voters who submitted mail-in ballots stating they are disabled. Barrera's petition asks for those ballots to be declared void because those people are not disabled. Others, the petition states, have permanent addresses in Alice but actually live in Corpus Christi." Julie Silva, Jim Wells Election Contest Goes to Court, Caller, July 29, 2012. "Matilde Galindo, who is 75 and illiterate, has no clue who she voted for last week. She said that late in June, Daisy Cabrera, an acquaintance of a distant relative, offered to help her register as a Miami-Dade County voter... Authorities are investigating Cabrera, 56, after finding her in possession of dozens of absentee ballots last week in Hialeah. It is the first case of its kind since a new county ordinance took effect this month that makes it a misdemeanor to possess two or more ballots belonging to someone else." Melissa Sanchez and Enrique Flor, As Hialeah absentee-ballot probe continues, voter regrets accepting help, Miami Herald, July 29, 2012. "The FBI has gotten involved in an investigation into allegations of voter fraud on the Big Island, sources told Hawaii News Now Friday...About one week ago, state officials received reports about possible voter fraud on the Big Island, allegations that someone was doctoring absentee ballots, sources said." Keoki Kerr, Sources: State Taps FBI for Help in Voter Fraud Probe, Hawaii News Now, July 28, 2012. "A Hinds County jury ordered Tuesday's election after finding the first runoff between Cooper-Stokes and Jackson was tainted by voter fraud." Report: Some votes not certified in Ward 3 City Council election, MSNBC, July 27, 2012. "Authorities say 56-year-old Luz Vargas registered El Paso, Texas, resident Mary Ann O'Brien to vote in Sunland Park's municipal election in March. They were charged Wednesday with false voting, conspiracy to commit false voting, registration offenses, falsifying election documents and false swearing." 2 more accused of fraud in Sunland Park election, San Francisco Gate, July 26, 2012. "A felon living in Louisa County registered to vote illegally and then cast a ballot in the 2008 presidential election after filling out and submitting a voter-registration form she received by mail from the Voter Participation Center, a state senator who prosecuted the case confirmed Wednesday." Mark Bowes, Louisa felon illegally registered after receiving form from Voter Participation Center, Richmond Times Dispatch, July 26, 2012. "A Pinal County supervisor candidate has withdrawn from the race in the wake of voter-fraud allegations involving a former companion who, records show, has continued to vote by absentee ballot in the five years since her death. His statement made no mention of the scandal unleashed in an anonymous, undated letter sent several weeks ago to the Pinal County Recorder's Office. As recently as this year, the letter alleged, someone had been filling out and mailing in absentee ballots addressed to a woman who died on Feb. 3, 2007. The woman, Sheila Nassar, and Enright lived together at the time of her death." Lindsey Collom, Pinal County supervisor hopeful John Enright quits, The Republic, July 26, 2012. "Three people from Breathitt County who were involved in a vote buying scheme in a 2010 magistrate's race are expected to be sentenced. Naomi Johnson, Jackie Jennings, and Earl Young all pleaded guilty or were convicted in the case." Three convicted in vote fraud case will be sentenced Thursday, WYMT, July 26, 2012. ""We believe that drug money did buy votes," Kerry B. Harvey, U.S. attorney for the Eastern District of Kentucky, said. He described a stunning vote-buying scheme that includes "very extensive, organized criminal activity, involving hundreds of thousands of dollars, and in many cases that involves drug money." Harvey has led a recent string of federal prosecutions exposing the widespread and accepted practice of vote buying in eastern Kentucky." Eric Shawn, Drug money funds voter fraud in Kentucky, Fox News, July 25, 2012. "A Macomb Township resident has filed a lawsuit against the county and Macomb Township clerks that challenges the validity of more than 50 signatures on supervisor candidate Janet Dunn's nominating petitions" Macomb Man Alleges Election Fraud, Sues Township, County Clerks, The Patch, July 23, 2012. "A special prosecutor has been appointed to handle a case involving allegations of voter fraud in Mississippi County." Special prosecutor to handle Ark. vote fraud case, Associated Press, July 20, 2012. "Lincoln County Commissioner Thomas Ramey is scheduled to plead guilty next month in connection with a vote fraud investigation." Guilty Plea Hearing Set In Vote Fraud Case, Metro News, July 20, 2012. "A 41-year-old Wisconsin Rapids man who was convicted of a felony in 2009 faces a new felony charge after authorities say he voted in the June 5 recall election. Brice E. Liezen is charged with voter registration fraud." Karen Madden, Felon charged with voter fraud, Daily Tribune, July 19, 2012. "The documents state that in city elections in 2007 and 2009, ballots in favor of challengers were discarded, while ballots that favored incumbents were retained." Olsen Ebright, Melissa Pamer and Jason Kandel, Election Fraud Alleged in Cudahy; 2 Accept Plea Deal, NBC Los Angeles, July 17, 2012. "Third Judicial District Attorney Amy Orlando announced Friday that voter fraud charges from a Sunland Park election were filed against Texas residents Jose Ramirez, Elizabeth Ramirez, Matthew Valenzuela and Santa Teresa, N.M. resident Nelson Owens." 4 more charged in Sunland Park voter fraud case, Associated Press, July 13, 2012. "A former candidate for Mohave County Sheriff was charged on felony counts for claiming to be a resident of the county when he actually was not. Michael David Hays of Flagstaff was charged in Kingman Justice Court on four counts of voter fraud. The first count stated that on March 11, 2010, Hays allegedly made fraudulent statements about his residence on a voter registration form. The second count stated that on Jan. 22, 2011, he allegedly made fraudulent statements on the form." Jim Seckler, Former candidate charged with voter fraud, The Daily News, July 12, 2012. "A convicted drug felon who pleaded no contest Tuesday to illegally registering to vote in the 2008 general election later withdrew her plea after a judge – concerned about her sobriety – ordered that she immediately be tested for drugs. She failed, testing positive for cocaine." Mark Bowes, Woman in voter fraud case jailed after positive drug screen, Richmond Times Dispatch, July 10, 2012. "A former Charlottesville City Council candidate will spend 60 days in jail for using a false address on campaign filings... Halfaday pleaded guilty in August 2011 to a felony election fraud count. Prosecutors say he no longer lived at an address he listed on campaign paperwork that he filed for the 2011 election." Voter fraud sends former Charlottesville Council candidate to jail, Associated Press, July 6, 2012. "There are about 325 supercentenarians in the country and 79th District Attorney Armando Barrera finds it hard to believe 18 of them voted in the Brooks County primary in May." Julie Silva, Allegations of voter fraud in Jim Wells, Brooks counties, Corpus Christi Caller, July 7, 2012. "Rangel holds a narrow lead of just 802 votes in the Democratic primary for New York's 13th congressional district -- 2,000 absentee and affidavit ballots are set to be counted on Thursday. Both sides are waiting for the final tally in a race marred by accusations from supporters of Rangel's challenger that there was widespread voter fraud and voter suppression aimed at Latino voters." Eric Shawn, Rangel opponent floats possibility of new election amid fraud claims, Fox News, July 3, 2012. "Two elections are now part of an FBI investigation into allegations of corruption at Cudahy City Hall. Transcripts of wiretaps allegedly show that local officials believed they could control election outcomes." In Cudahy, FBI probes allegations of election fraud, Los Angeles Times, July 3, 2012. "Last month, 4 On Your Side investigative team showed an undercover video of a political operative Elias Fresquez telling our producer who to vote for and offering whiskey as he drove him to an early voting site." 4 On Your Side: State police to investigate Espanola voter fraud, KOB News, July 2, 2012. "Robert Gilchrist, former director of the Lorain County Community Action Agency and Lorain city official, was secretly indicted on four counts of illegal voting." Kaylee Remington, Gilchrist indicted for voter fraud, The Morning Journal, Jun. 26, 2012. "Republican recount observers are raising a red flag over votes cast by residents who registered on election day after pages of missing signatures from same-day voters have been discovered throughout the City of Racine." Heather Asiyanbi, More Election Snafus Reported in Racine Recall Election, Caledonia Patch, Jun. 26, 2012. "A grand jury handed down an indictment against Feda Kidd Morton Monday morning in Fluvanna County Circuit Court, formally accusing her of making a false statement on a voter registration form, Commonwealth’s Attorney Jeffery W. Haislip confirmed." Fluvanna school teacher officially indicted in voter fraud, The Daily Progress, Jun. 25, 2012. "The commissioner of the state Department of Education is investigating election fraud accusations at the Ravena-Coeymans-Selkirk School District... John Allen said he brought up concerns because he saw more than one person vote more than once at the May 15 election, saw students wearing "Vote Yes" T-shirts in the polling place and said the voting procedures were disorganized." RCS vote subject of state fraud probe, Times Union, Jun. 20, 2012. "Prosecuting Attorney Scott Ellington has asked a state police investigator to look into suspected absentee ballot fraud in one Region 8 county." Ellington asks Investigator to look into suspected voter fraud, KAITC8 ABC, Jun. 19, 2012. "The Racine County sheriff's department is trying to find out how election related documents ended up in a dumpster. The sheriff's department confirms they are investigating possible voting irregularities at the Cesar Chavez Community Center." Racine County sheriff's department looking into possible voting irregularities, WTMJ, Jun. 14, 2012. "The political furor is complicated by allegations of election fraud in a mayoral vote that tallied just 706 ballots. Town Manager Alex Taft announced during this week's council meeting that 168 votes are under investigation. Cowell said she and other incumbents believe "something is not right" because about 300 new voters registered before the election, including some staying on federal lands. "We have proof that there were (three) people who were dead who voted," she added." Dennis Wagner,Quartsite refuses to seat winning mayor, Arizona Republic, June 14, 2012. "The Monroe County district attorney's office charged the embattled former Middle Smithfield Township golf course director with several counts of voter fraud Monday. Robyn Pugh was charged with perjury, false swearing in official matters and unlawful voting. She could receive up to 10 years in prison and fines of $20,000. The DA alleged that Pugh registered to vote in Middle Smithfield Township and voted there four times when she was actually living in Stroud Township." DA charges ex-Middle Smithfield golf director Pugh with voter fraud, Pocono Record, June 11, 2012. "Russo testified that he figured Gallucci's sham candidacy saved him about $50,000 in campaign advertising he didn't have to pay." James F. McCarty, Former Cuyahoga County employee is sentenced to prison for running a sham election in 2006, Plain Dealer, June 6, 2012. "Sheila J. Peterson, 53, was indicted Monday by a Chesterfield County grand jury on one felony count of making a false statement on an election form on Oct. 3, 2008, according to court records. Last week, Michael Anthony Harris, 50, was arrested in Chesterfield on a similar charge for an offense that occurred on Sept. 26, 2008, records show." Mark Bowes, State voter fraud investigation results in two more arrests in Chesterfield , Richmond Times-Dispatch, May 25, 2012. "A KAMC investigation shows Harvey has reason to question her election. We obtained a copy of the official list of voters filed with the Texas Secretary of State's Office by officials in Crosby County. That list says 187 people voted in the recent election. We also go a copy of the tally sheet used by election officials to count the votes. It lists 199 total votes for mayor... Rowland and Jane King said two of their neighbors were given ballots for council races where they weren't eligible to vote. When they went to City Hall to question the validity of that, nobody could give them an answer." Nick Ochsner,KAMC Investigates: Voter Fraud in the City of Lorenzo, KAMC, May 23, 2012. "A northern Idaho county is investigating possible election-night fraud after one voter may have voted twice in the May 15 primary. Kootenai County told the Coeur d'Alene Press a precinct poll worker didn't notice a voter had already voted absentee before showing up to a polling place and voting in person, too." Associated Press, N. Idaho officials investigating possible voter fraud, KIVI-TV, May 23, 2012. "Moving swiftly after a judge dismissed its case, the district attorney's office refiled 24 perjury and voter-fraud charges late Thursday afternoon against Councilman Richard Alarcon and his wife, Flora Montes De Oca Alarcon. The new charges make the same allegations as a case thrown out by Superior Court Judge Kathleen Kennedy on Thursday morning, accusing the Alarcons of lying about living in a house in Panorama City so that the councilman could run for his 7th District office. "Perjury, Fraud Charges Refiled Against Richard Alarcon And Wife, Los Angeles Times, May 4, 2012. "A former Oshkosh woman will stand trial on two counts of election fraud and two counts of falsifying nomination papers. Forty-four-year-old Yadira Colon was bound over for trial Thursday in Milwaukee County." Woman to Be Tried for Election Fraud, Associated Press, May 3, 2012. "Austin Mayor Douglas Campbell and a city employee surrendered Tuesday to face the felony voter fraud and conspiracy charges. The accusations include that they illegally accepted absentee ballots from voters and that Campbell in one instance filled out a woman's incomplete ballot." Southern Indiana mayor faces voter fraud charges, Associated Press, May 2, 2012. "Voter registration applications from three men who listed the Glendale Residence Inn as their address is what sparked this investigation…The three including Austin Thompson, who was arrested last year during an occupy protest, are accused of voter fraud by registering and voting even though they lived in a hotel." Milwaukee County DA investigating voter fraud claims, WTMJ4, Apr. 26, 2012. "As Virginia legislators hotly debated a voter ID bill that narrowly passed the General Assembly, many were unaware of a state police investigation that, so far, has resulted in charges against 38 people statewide for voter fraud. Warrants have been obtained for a 39th person who can't be located. A majority of those cases already have resulted in convictions, and 26 additional cases are still being actively investigated nearly 3½ years after the state Board of Elections forwarded more than 400 voter and election fraud allegations from 62 cities and counties to Virginia State Police for individual investigation." Mark Bowes, Va. Investigates voter fraud , Richmond Times Dispatch, Apr. 22, 2012. * Shalonda Michaelle Brinson, 36, charged with nine counts of fraud in connection with casting a vote, and one count of provided a false report to law enforcement authorities." Julie Montanaro and Mike Springer, Madison 9 Attorney Speaks Out, WCTV, Apr. 14, 2012. "In one of the disallowed ballots, the chamber alleged voter Gary Sabara Jr. actually lived in Buena Park. Frederic Woocher, the chamber's attorney, presented evidence gathered by a private investigator, including Sabara's Facebook page and an Orange County Register article that listed him as a resident of Buena Park." Sam Allen, Vernon council election thrown into chaos by fraud allegations, Los Angeles Times, Apr. 10, 2012. "Prosecutors in South Bend, Ind., filed charges Monday against four St. Joseph County Democratic officials and deputies as part of a multiple-felony case involving the alleged forging of Democratic presidential primary petitions in the 2008 election, which put then-candidates Barack Obama and Hillary Clinton on the Indiana ballot. The officials are accused of taking part in a scheme to fake signatures and names on the primary petitions needed to run for president. Court papers say the plan was hatched by local Democratic Party officials inside the local party headquarters. Among those charged is the former long-time chairman of the St. Joseph County Democratic Party, Butch Morgan, who allegedly ordered the forgeries...The St. Joseph County Board of Voter Registration's Democratic board member, Pam Brunette, Board of Voter Registration worker Beverly Shelton and Democratic volunteer and former board worker Dustin Blythe also face charges." Eric Shawn, 4 Indiana Dems charged with election fraud in 2008 presidential race, Fox News, Apr. 3, 2012. "Attorney General J.B. Van Hollen announced today that Michael Henderson, of Milwaukee, was convicted of election fraud arising out of the 2008 general Presidential election. Henderson was convicted of Election Fraud - Providing False Information to Election Official, a Class I felony. An additional count of Voting By Disqualified Person was dismissed against Henderson but read-in for the purposes of sentencing." Van Hollen announces voting fraud conviction, Bay View Compass, Mar. 22, 2012. "Prosecutors say Bowman and former Lincoln County Clerk Donald Whitten, 62, were part of a scheme to steal the May 2010 Democratic primary by stuffing ballot boxes with illegal absentee ballots. Bowman admitted to falsifying more than 100 of the absentee ballot applications and even voting with some of the ballots himself, while Whitten, who also pleaded guilty Wednesday, acknowledged lying to investigators about the plan to try to throw the election." Eric Shawn, Former West Virginia sheriff, county clerk plead guilty to attempting to steal election, Fox News, Mar. 7, 2012. "Records from the Baldwin County Board of Registrars show that Hernandez-Hernandez is registered to vote under the name of Severo Benavidez, the name he used for almost 4 decades after slipping into the United States from his native Mexico in the 1970…Ed Packard, an election official with the Alabama Secretary of State's Office, said Baldwin County's voter rolls have included Severo Benavidez since 1984. Packard said the 62-year-old man voted in the 1996 and 2008 general elections, the 2002 primary election and special elections on a constitutional amendment to overhaul Alabama's tax system in 2003 and to incorporate Perdido Beach as Baldwin County's 14th municipality in 2009." Brendan Kirby, Baldwin man convicted of fraud voted regularly under name of U.S. citizen, records showPress-Register, Mar. 6, 2012. "A former Sunland Park city councilor and a current city employee were charged today in the alleged voter-fraud scheme that has rocked the town. Priscilla Morales, the public works director's secretary, and former Councilor Angelica Marquez each face fourth-degree felony charges of false voting and conspiracy to commit false voting." Heath Haussamen, Two more charged in Sunland Park voter-fraud scheme, N.M. Politics, Mar. 6, 2012. "In the new case, investigators allege that Gomez pushed two El Paso residents to illegally register to vote in Sunland Park and then cast ballots in the mayoral race for Salinas... When the two advised Gomez they were Texas residents, "Silvia Gomez told them it was okay and that they could use Silvia Gomez's address as their residence on the voter registration form," the criminal complaint states." Heath Haussamen, Sunland Park employee arrested on false voting charges, N.M. Politics, Mar. 4, 2012. "Carlos Medrano was sentenced to 180 days in county jail, five years probation and assessed a $2,500 fine." Rudolph Bush, Carlos Medrano guilty of one count of illegal voting. Frank Medrano not guilty of perjury chargesDallas News, Feb. 27, 2012. "The warrant states that Jackson registered to vote in Montgomery County on Oct. 4, 2011, and used the address of 305 N. Tomlinson St., Candor, the same address as Wayne Holyfield, a state trooper who was elected to the Candor Board of Commissioners last November and has been embroiled in a controversy over firing four of the five officers on the town police force. According to the warrant, Jackson lived at 131 Young Drive, Lexington, at the time of the election and had lived there since Sept. 16, 2011. The warrant also says that Jackson voted in the Candor municipal election on Nov. 8, 2011, and was not a resident of Candor for at least 30 days preceding the election as required by law." Mary Anderson, Jackson charged with voter fraud in Montgomery County, Courier-Tribune, Feb. 17, 2012. "A former candidate for the Marlborough City Council was arraigned yesterday on voter fraud charges for allegedly handing in an absentee ballot application for a man who had died earlier in the year, Middlesex prosecutors said yesterday. Mark Evangelous, 51, of Marlborough, faces charges of forgery, uttering, and violating absentee voting laws, District Attorney Gerard T. Leone Jr.'s office said. "Marlborough man accused of voter fraud, Boston Globe, Feb. 16, 2012. "A Fairfield County woman will serve jail time for providing two false signatures on a liquor-option petition filed with the county Board of Elections last year. County Common Pleas Judge Richard E. Berens sentenced Melissa R. Schilling, 46, of Baltimore, on Friday, after she pleaded guilty to two counts of the fifth-degree felony, a court spokesman said." Mary Beth Lane, Fairfield County woman sentenced for falsifying petition signatures, Columbus Dispatch, Feb. 13, 2012. "A 35-year-old Glenoma woman who emigrated to the United States from Ghana, Africa, is accused of voter fraud in Lewis County Superior Court. Marda Aglubi-Blomstrom is expected on Feb. 16 to enter a plea to one count of providing false information on an application for voter registration." Adam Pearson, Glenoma Woman Charged with Voter Fraud, The Chronicle, Feb. 7, 2012. "'I vote every year,' Hinako Dennett told NBC2. The Cape Coral resident is not a US citizen, yet she's registered to vote. NBC2 found Dennett after reviewing her jury excusal form. She told the Clerk of Court she couldn't serve as a juror because she wasn't a U.S. citizen. We found her name, and nearly a hundred others like her, in the database of Florida registered voters. Naples resident Yvonne Wigglesworth is also a not a citizen, but is registered to vote. She claims she doesn't know how she got registered…Records show Wigglesworth voted six times in elections dating back eleven years. 'I know you cannot vote before you become a citizen, so I never tried to do anything like that,' Samuel Lincoln said. He isn't a U.S. citizen either, but the Jamaican national says he doesn't know how he ended up registered to vote. 'It's their mistake, not mine,' said Lincoln. We obtained a copy of his 2007 voter registration application. It's clearly shows he marked U.S. citizen." Andy Pierrotti, NBC2 Investigates: Voter fraud, Feb. 2, 2012. "12 former Brooks County officials were indicted for voter fraud. The suspects are accused of illegally helping people vote by absentee ballot…. The defendants include some workers in the voter registrar's office and some school board members. They are Angela Bryant, April Proctor, Brenda Monds, Debra Denard, Lula Smart, Kechia Harrison, Robert Denard, Sandra Cody, Elizabeth Thomas, Linda Troutman, Latashia Head, and Nancy Denard." Stephen Abel, 12 former officials indicted for voter fraud, WALB, Nov. 28, 2011. Check out a survey of vote fraud over the past decade. However, Adams said there’s a much bigger problem than either of those matters. This is the tip of the iceberg, voter fraud is so entrenched we are going to be lucky if we ever have a REAL election again IMHO. But it’s also important to note that this is not her first time running afoul of the law since her career in public service began in 2012. In 2012, she was fined $350 for a hit-and-run accident not long after winning the Democratic primary for her House seat. She also faced domestic violence charges for getting into a fight with her boyfriend, although those were eventually dropped. The Election Law Center blog also notes that the Connecticut State Elections Enforcement Commission recommended criminal prosecution against Ayala’s mother, Democratic Registrar of Voters Santa Ayala, too, for alledgedly aiding her daughter. Folks, if nothing else, this arrest underscores just how important protecting the right to vote. It’s more than simple coincidence that most of those who oppose measures to protect that right come from the same party that counts among its members so many who have been prosecuted for voter fraud. Heads up EVERYONE on mail in ballots , DO NOT FILL out and send in early....more time for fraud to be perpetrated and your ballot to be tampered with. There is codes on the mail back envelopes that state what your political affiliation is. Walk the ballot in on the last day, if you are in a state that only has mail in ballots. Fraud is going to be rampant in November especially in states like Colorado with all mail in ballots. The more time they have to tamper with ballots the more likely that Dems will have the election in the bag.